Midterms are right around the corner, starting on Tuesday, January 30 and ending on Friday, February 2. Emerson Junior and Senior High School students are beginning to prepare by studying. Students were asked how they prepare for their exams. “I am reviewing my review packets and looking over my notes,” Lianna Isakhanian said, when asked how she plans to review. Megan White, another freshman, is going to go in for extra help to get help from teachers for her midterms. “I am going to study every night and go in for extra help with teachers to prepare,” she said. 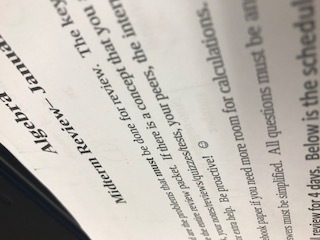 If you have not started reviewing for midterms, make sure you start now so you do not end up cramming, and don’t forget that Monday is an S-Day, so you will meet with all your teachers for review. Wave of wellness hits EHS! What happened to the furniture? “Sunday Morning Fever” comes to EHS in March! Wellness Fair coming to EHS! EHS rings in the New Year with resolutions!